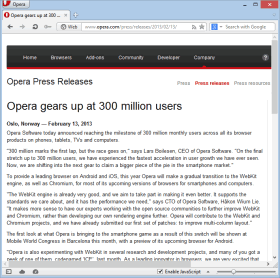 In a press release innocently titled Opera gears up at 300 million users, Opera Software has confirmed what had been suspected for a while: future versions of the Opera desktop web browser will use WebKit rather than their proprietary Presto rendering engine. It’s odd how so many people seem to consider the adoption of WebKit to be the end of Opera as a unique web browser. Both Safari and Chrome already use WebKit and no one is likely to confuse the two browsers. They maintain their unique identities and I’m sure that Opera will do the same. The reality is that Opera Software is a business, and undoubtedly has determined that maintaining their own rendering engine is no longer the best use of their resources. Opera has a long history of changing with the times and this is just another example. Opera Version History is an interesting page which details when each Opera feature was introduced and when it was made final. But as more and more people (and site owners) started getting faster broadband connections, sites began integrating images into their pages. You might think that page text would load before the images and that dial-up users would be relatively unaffected, but that wasn’t how it (always) worked. Usually the text would partially load, then stall until all the pictures had loaded. For a site with many images, a simple page load might take minutes before you saw anything at all. Even worse, complicated sites often timed-out before anything displayed. This rendered many sites effectively unviewable with my dial-up connection. The only solution in most browsers was to disable all images. Only Opera allowed you to disable images on a page-by-page basis using a single button. Better than that, you could load images individually using a right-click menu. This meant that you could load the complete text of a page and then load the images as you needed them. No other browser could do that (and no other browser still can). Page loading times were effectively reduced from minutes to seconds, and I could load some sites only in Opera. I stayed with Opera for quite a while even after I got broadband. Since then, I have become a browser nomad, switching to Firefox, then Chrome, then Safari, back to Opera, back to Firefox, and back to Chrome again. Filed under Thoughts and tagged Opera. Opera was the only choice for dialup but its a great choice for broadband. I’m a big fan of Opera for Android too. I have my doubts about replacing Presto with Webkit but I’ll wait to see how it turn out.